Raipur District Court Notification is out. Raipur District Court is recruiting for 25 Assistant Grade III Post Posts. You can check Raipur District Court - Raipur District Court last date, download Raipur District Court notification, visit Raipur District Court official website and check other Raipur District Court Vacancy details.Complete Vacancy and recruitment Details about 25 Assistant Grade III Post vacancies in Raipur District Court are provided below by JobSarkari.Com only for you. Candidate Must Have Passed Graduation With 45% Marks (40% for SC / ST) and Diploma in Computer Application With Typing Speed of 5000 Key Depression Per Hour. Q. 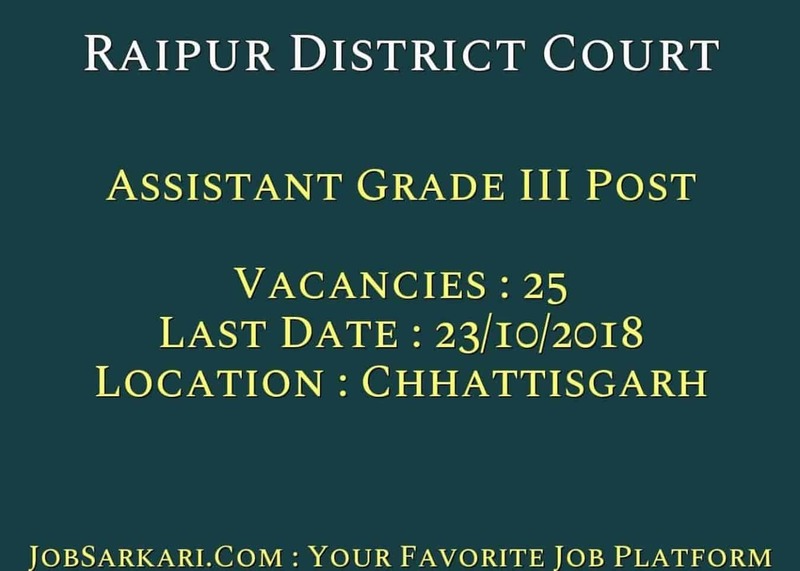 What is the Last Date For Raipur District Court Assistant Grade III Post Vacancy ? A. 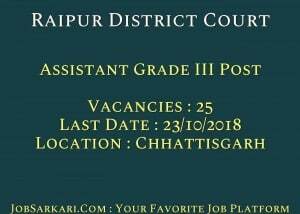 Last Date for Raipur District Court Assistant Grade III Post Posts is 23/10/2018. Q. What is the Form Type of Raipur District Court Assistant Grade III Post Recruitment ? A. The Form Type for Raipur District Court Assistant Grade III Post Posts is Online. Q. How many vacancies are available in Raipur District Court Assistant Grade III Post Posts ? A. There are about 30 Vacancies in Raipur District Court Assistant Grade III Post Posts. Q. What is the Full Form of Raipur District Court ? A. Full Form of Raipur District Court is Raipur District Court .